TCU point guard Alex Robinson finishes at the rim against Central Michigan. Photo by Cristian ArguetaSoto. 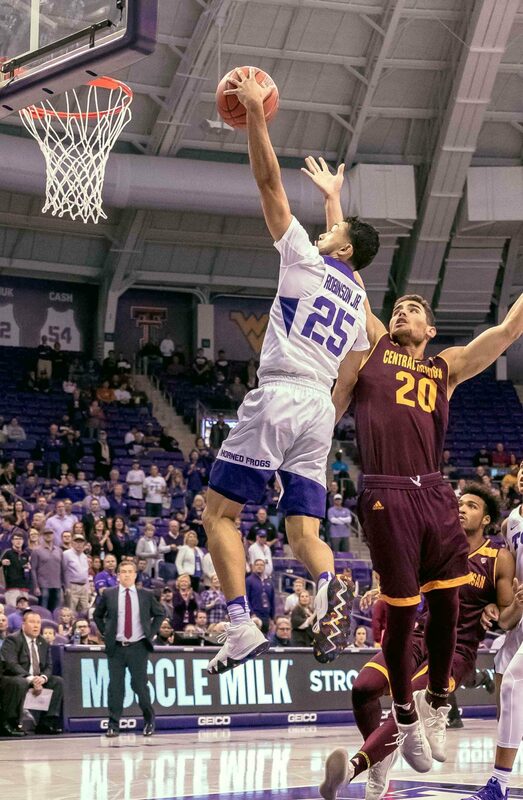 Senior point guard Alex Robinson and the rest of TCU men’s basketball have turned the phrase “sharing is caring” into an on-court manifestation as TCU leads the nation in assists per game with 22.2. Robinson leads the nation individually with 9.5 per game. After consecutive wins against Eastern Michigan and Central Michigan, including a season-high 89 points against the Chippewas Friday, Jamie Dixon’s team seems have found its offense at the perfect time. The Horned Frogs travel to Dallas to play SMU Wednesday and Los Angeles on Friday for a contest against the University of Southern California. Another critical component to the offense finding its rhythm has been the return of both junior point guard Jaylen Fisher and redshirt sophomore forward Kouat Noi from knee injuries. “Alex has had big numbers in the last couple games too, so with Kouat and Jaylen in there too, that’s going to help,” said Dixon. 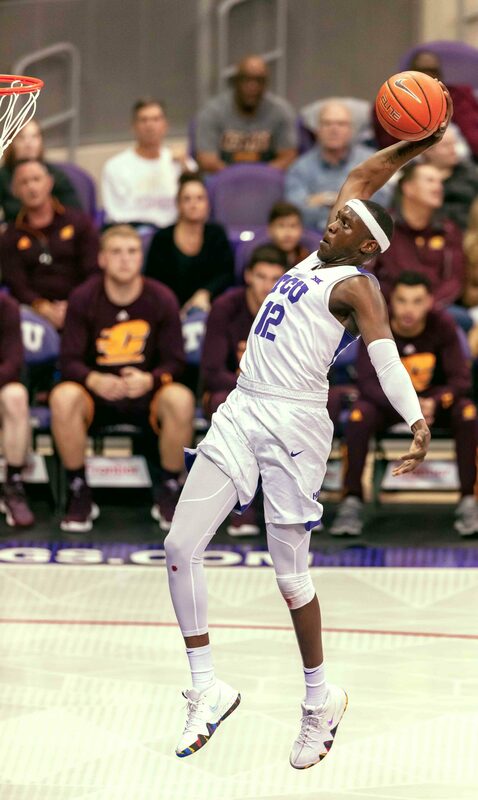 TCU forward Kouat Noi throws down a slam dunk against Central Michigan. Photo by Cristian ArguetaSoto. Noi put together a career-best performance against Eastern Michigan, pouring in 27 points. Fisher scored 12 points against Eastern Michigan and then added 14 against Central Michigan. The junior sat out for about 11 months after suffering a meniscus tear in his right knee during a team practice last January. After two knee procedures, Fisher’s return has allowed the Horned Frogs to play a more efficient offense. However, Fisher’s impact extends beyond his abilities as a ball-handler. Dixon said his movement without the basketball creates opportunities for Robinson to find him and others for easy baskets. 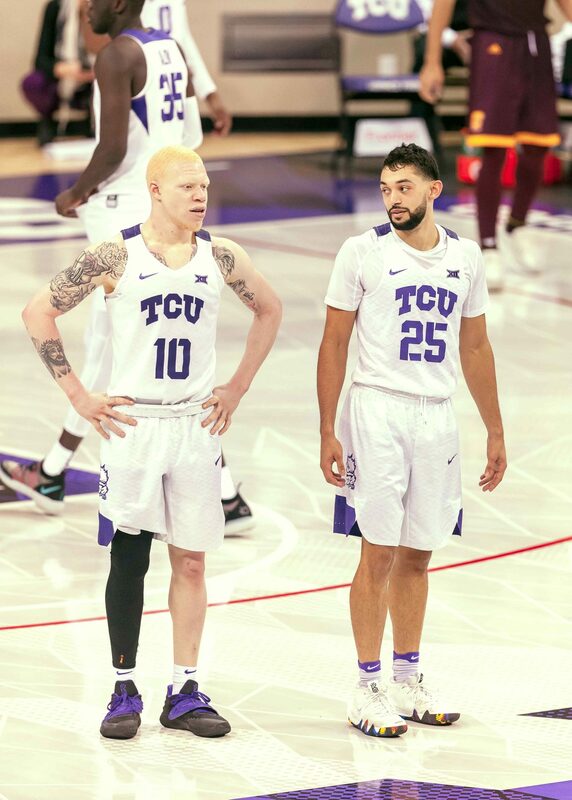 TCU point guards Jaylen Fisher (10) and Alex Robinson (25) talk strategy against Central Michigan. Photo by Cristian ArguetaSoto. Through six games, Robinson is tied with Jeff Jacobs for fourth-place all-time in program history with 475 assists. Jacobs suited up for the Horned Frogs from 1993-1997. The senior is 100 assists away from tying the program leader, Corey Santee, who is now an assistant coach on Dixon’s staff. It’s not just Robinson whose assists numbers have continued to impress. Freshman backup Kendric Davis got in on the action Friday against Central Michigan, playing a turnover-free 12 minutes while accumulating six assists, a career-best. “That was his best game for us, we’ve been talking to him about being a point guard that gets other guys shots, and he had six assists and no turnovers, which is what we’ve been working on and that’s what he did,” said Dixon. 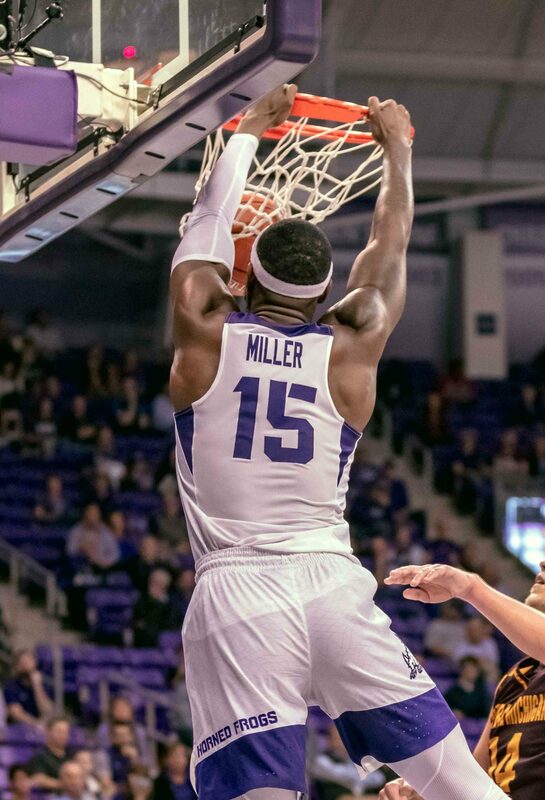 The Horned Frogs leave the friendly confines of Schollmaier Arena this week for their next two tests as they face SMU at 9 p.m. Wednesday before playing USC at 8:30 p.m Friday. Playing in a battle for Metroplex bragging rights, the Mustangs are re-integrating one of their best players into its lineup, forward Jarrey Foster, following a torn ACL that ended his 2017-2018 season. “They are similar to us as far as fitting a guy in they were counting on in Foster who wasn’t playing early and is now back,” said Dixon. TCU vs. SMU has long been a historical rivalry, and it’s one that will be felt on the hardwood Wednesday. USC enters Friday’s game coming off a 73-61 loss to No. 6 Nevada this past Saturday, the team the Horned Frogs defeated a year ago in Los Angeles, 84-80.